WR 1839 was granted (gifted) by Wichita Refuge to Fort Niobrara Refuge in Nebraska. 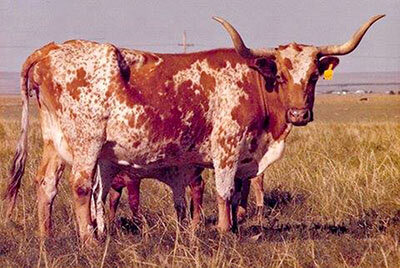 She was a daughter of the largest horned WR cow WR 1052. (see history of WR 1052). Although the FN herd was a result of lower end WR granted breeding stock, WR 1839 made drastic genetic forward steps for FN. I became a fan of the forward motion of 1839 and found in the FN records (they let me live in their files for hours) that 1839 was dam, grand dam or great grand dam of 62 FN breeding stock. She was the dam of US 325 which I offered the FN manager, Robert Ellis $20,000 for her. I thought she was a near perfect brindle cow. He refused. Years later I bought her as an open cow in the FN sale for $3200 and flushed her in embryo getting several pregnancies. WR 1839 was dam of US 303 a big dun spotted Niobrara bull who was a major sire of the better FN cattle. US 303 sired US 021 who had about 65" horn T2T. US 021, who's skull hangs in the ITLA office today, was the widest horned US cow of all times, wider than any WR cows. WR 1830, (discussed in the WR 1052 history) and WR 1839 sold in the FN annual auction at age 15. Both were bred. Charles Schreiner III of the YO Ranch, drove to FN, was disguised in a sock hat and hid in the crowd of Nebraska farmers, bid on both cows. I was discouraged when I saw him bidding, but I bought them both for more than they were worth. 1839 had a FN sired heifer the next year, then a Texas Ranger son and an Impressive daughter that we named Impressive Blessing. She was the grand dam of the many times Champion Bail News that DCCI sold to El Coyote. When Impressive Blessing was a mid teenager, I gave her to Lana Hightower. I sold WR 1839 to Veryl Goodnight, famous sculptor, and she used her for a model for her monument "Old Maude" which is at the Haley Memorial Library at Midland, Texas. In 1980 I encouraged Fort Niobrara to AI their best cows to Classic, the most popular bull of that day. They got several calves. Then, same as the WR, the federales told them to get rid of the non FN blood. They sold them all. I bought a grand daughter of 1839 sired by Classic for $4500 and named her "Classic Bureaucracy." What a mess of bureaucracy the feds are. Robert Ellis was manager of FN for about 25 years. He had some interesting ideas. He placed all the FN adult bulls in the tourist exhibition pasture, together, all winter. When they came off the cows, and all went into about a 500 acre pasture, it was world war III. US 303 was king bull for many years and Robert would give the king bull the lion's share of the cow herd. He said in the wild that was the way it would have been. As a result of the "winter wars" bulls that were vicious, mean as sin, hot tempered, with horns pointing forward, close to their head, normally won. As a result the cow herd began, over many years, to become like the king bull's mind set. The FN cattle were nervous and some of the hardest to handle. To watch the annual FN sale and see how the cows handled was very negative to non-matador types.